Live Turning and Milling - P.D. Peterka & Associates, Inc. The live turning and milling machines have enhanced the process of manufacturing. Live turning and milling machines allow for multiple processes to occur in just one set up in that machine, without setting up individual turning and milling machines for each process. 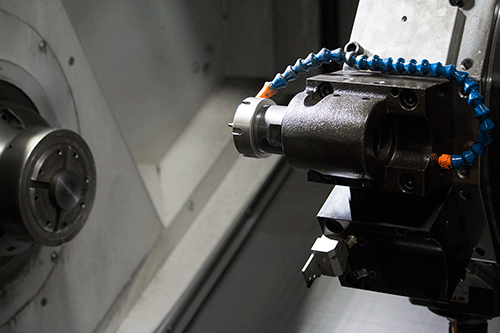 Live tools like those on CNC machines combine separate tasks such as milling and boring on the turn center. The market demands short lead times, smaller lot sizes, and low inventory, which creates a need for live tooling efficiency. The live turning and milling process uses x- and y-axis tool movement that gives movement of the live tool along the spindle. The y-axis gives flexibility. The spindle or c-axis gives live tooling precise circular orientation for positioning and contouring motion. The machines also have a z-axis, which gives another area of machine movement. P.D. Peterka added a y-axis to increase linear motion capability, which is said to increase linear motion capability of a turn/mill machine tool by 33 percent. There are many benefits to live turning and milling. One great benefit is the shorter amount of time in machining a product. Imagine a production switchover that can take as little as 10 to 15 seconds. P.D. Peterka passes the time saved as cost savings to you for your machined parts. CNC live turning and milling provides the opportunity for small lot sizes or shorter runs, as only one machine is setup versus multiple. Accuracy is another great benefit to live turning and milling. The opportunity to keep a machined part on one machine can create precise measurements that result in the ability to produce a more intricate machined part. At P.D. Peterka & Associates we have CNC machinery that will allow for live turning and milling when machining products. We efficiently create products that decrease cost and time, making outsourcing the comfortable choice for you.